If the name doesn't give you enough of a clue, the photo probably will. This is a quirky but nice place. 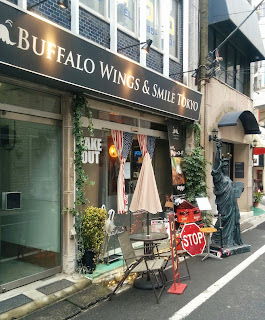 It has very much an American theme and as well as the Statue of Liberty outside there is a lot of Marvel and other American character paraphernalia and a couple of guitars on the walls. There are six counter seats and table seating for about six. I noticed a couple of extra folding chairs so you could fit a few more people in. There wasn't a "No Smoking" sign but I didn't see any ashtrays so I guess it's a smoke free bar. There were only two beers on tap, both of which were American. The glass sizes were a bit unusual. I guess they were about 300ml. Prices were ¥799 for both. There were 10 bottled beers, again all American. The bottles were good. Nothing unusual but solid American crafts. There were no prices on the bottle menu. I was given some popcorn when I sat down so I was expecting a charge but there wasn't one. The owner just seems to be a friendly guy. However, all beer prices were excluding tax. I guess I should mention the Buffalo Wings in the name. They come with a huge variety of sauce options which range from mild to super spicy and you can choose boneless wings if you prefer. Overall, this is a small place and it only has two craft beers on tap. Very much an American theme. It is very friendly and kids would like the decor. It is less than one minute from Riddle so going to both would be a good plan.